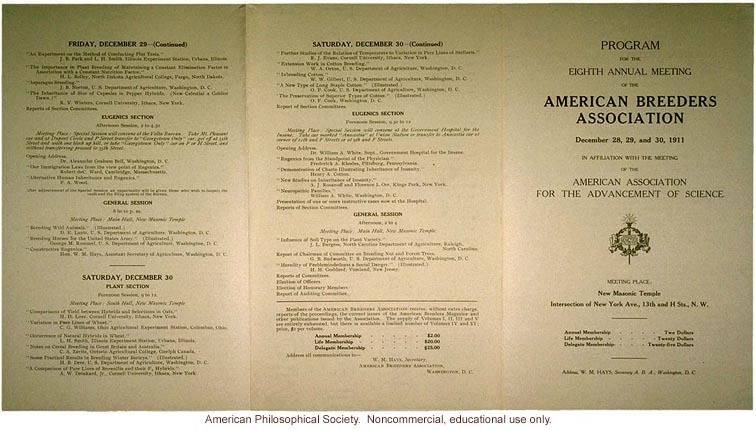 [NOTE this image is comprised of elements from both 401 and 402] Program for the Eighth Annual Meeting of the American Breeders Association December 28, 29, and 30, 1911 In Affiliation with the Meeting of the American Association for the Advancement of Science [graphic] Meeting Place New Masonic Temple Intersection of New York Ave., 13th and H Sts., N. W. Annual Membership... Two Dollars Life Membership ... Twenty Dollars Delegate Membership ... Twenty-five Dollars Address, W. M. Hays, Secretary A. B. A., Washington, D.C. / Program American Breeders Association 1911 Place of Meeting The Law Department of George Washington University has courteously placed at the disposal of the American Breeders Association rooms in the New Masonic Temple, intersection of New York Avenue, 13th and H Streets, N. W. In the "Main Hall," located on the fifth floor, will be held the general sessions and those of the Eugenics Section. In the South Hall will be held the sessions of the Plant Section. In the North Hall will be held the sessions of the Animal Section. Thursday, December 28 Forenoon Session, 9 to 11 Meeting Place: South Hall, New Masonic Temple "A Study of Individual Performance in Hops." W. W. Stockberger, U. S. Department of Agriculture, Washington, D. C. "Some Observations on Tobacco Breeding." W. W. Garner, U. S. Department of Agriculture, Washington, D. C. "Certain Results in Ohio Tobacco Breeding." True Houser, Germantown, Ohio. "Breeding Alfalfa as a Dry Land Crop." (Illustrated.) A.C. Dillman, U. S. Department of Agriculture, Washington, D. C. "Physiological Investigations in Relation to Breeding Dry Land Crops." T. H. Kearney, U. S. Department of Agriculture, Washington, D. C. "Seed Types within Forage Plants." M. O. Malte, Department of Agriculture, Ottawa, Canada. "Breeding Experiments with Forage Crops in Florida." John Belling, Agricultural Experiment Station, Gainesville, Florida. Reports of Committees. Animal Section Forenoon Session, 9 to 11 Meeting Place: North Hall, New Masonic Temple "The Inheritance of Horns and some Wool Characters in Sheep." R. T. Arkell, Agricultural Experiment Station, Durham, New Hampshire. "Dual Purpose Individuals and Total Fat Production." E. N Wentworth, Iowa State College, Ames, Iowa. "Evolution of the Type of Saddle Horse." W. F. Anderson, Winchester, Kentucky. "Mendelian Segregation in Cattle." (Illustrated.) E. N. Wentworth, Iowa State College, Ames, Iowa. Committee Reports. Section Business Meeting. Election of Section Officers. General Session Forenoon, 11 to 12.30 Meeting Place: South Hall, New Masonic Temple "The Effect of Research in Genetics on the Art of Plant Breeding." Annual Address by Chairman of Plant Section. Dr. Herbert J. Webber, Cornell University, Ithaca, New York. / Thursday, December 28 - (Continued) Report of Committee on Teaching Genetics. A.W. Gilbert, Cornell University, Ithaca, New York. "Improvements in the Technique of Corn Breeding." (Illustrated.) G. N. Collins, U. S. Department of Agriculture, Washington, D. C. Reports of General Committees. New Business. Appointment of Committees. Presentation of Resolutions. Plant Section Afternoon Session, 2 to 4.30 Meeting Place: South Hall, New Masonic Temple "Apple Breeding in Canada." W. T. Macoun, Central Experimental Station, Ottawa, Canada. "Domesticating Grapes." U. P. Hedrick, New York State Experiment Station, Geneva , New York. "Apple Breeding." S. A. Beach, Iowa State Agricultural College, Ames, Iowa. "Longaviabo, a Composite Hybrid of Six Species of Grape." Steps in its production and results of each successive combination. T. V. Munson, Grape Breeder, Denison, Texas. "How Collection of Forest Tree Seed should be regulated to Gain the Benefits of Environment." George L. Clothier, Pullman, Washington. "Results in Breeding Hardy Fruits." (Illustrated.) N. E. Hansen, South Dakota Agricultural College, Brookings, South Dakota. "Methods for the Improvement of Sorghums." A.H. Leidigh, Kansas State Agricultural College, Manhattan, Kansas. "Some Characters Correlated with Yield in Flax." O.W. Dynes, North Dakota Agricultural College, Fargo, North Dakota. "Breeding Winter Hardiness in Plants for the Cold Northwest." L. R. Waldron, North Dakota Experiment Station, Dickinson, N, Dakota. "Principal Fiber Crops of the Philippines." M. A. Saleeby, Manilla, Philippine Islands. Reports of Committee. Friday, December 29 Plat Section Forenoon Session, 9 to 11 Meeting Place: South Hall, New Masonic Temple "Relation of Tree Breeding to Permanet Agriculture and Soil Conservation." J. Russell Smith, Philadelphia, Pensylvania. "First Generation Hybrids of Chinese-American Corn." H. R. Roberts, Kansas State Agricultural College, Manhattan, Kansas. "Results of Tests with First Generation Corn Crosses." L. L. Zook, U. S. Department of Agriculture. "The Relation of Ear Character s to Earliness in Corn." H. H. Love, Cornell University, Ithaca, New York. "Corn Yields as Influenced by the Growing Conditions of the Previous Seasons." C. P. Hartley, U. S. Department of Agriculture, Washington, D. C. "Methods in the Artificial Pollination of Corn." W. B. Germert, Champaign, Illinois. "Selecting Corn to Produce Early Maturity" H. J. Webber, Cornell University, Ithaca, New York. / Friday, December 29 - (Continued) "Methods of Corn Breeding." Herbert K. Hayes, Comm. Agric'l Experiment Station, New Haven, Conn. "The Inheritance of Certain Abnormalities in Corn and Methods of Eradicating them." R. A. Emerson, University of Nebraska, Lincoln, Nebraska. "A Practical Illustration of Ten Years' Work in Commercial Corn Breeding." Eugene D. Funk, Bloomington, Illinois. Reports of Committees. Election of Section Officers. Animal Section Forenoon Session, 9.30 to 11 Meeting Place: North Hall, New Masonic Temple "Significant Facts for Breeding Duroc Jersey Swine." H. W. Mumford, Illinois Experiment Station, Urbabn, Illinois. "A Preliminary Report on Inheritance of Mammae in Swine." R. N. Wentworth, Iowa State College, Ames, Iowa. "Nutrition as a Factor I Fortal Development." John M. Evvard, Iowa State College, Ames, Iowa. "Recent Progress in Breeding Black and Silver Foxes." Benj, I. Rayner, Alberton, P. E. L., Canada, and J. Walter Jones, U. S. Department of Agriculture, Washington, D. C. "Some Probabilities in Fur Farming." (Illustrated.) Vernon Bailey, U. S. Department of Agriculture, Washington, D. C. "Circuit Breeding." Hon. W. M. Hays, Washington, D. C. "Conservation of Fur Bearing Animals in Alaska." R. W. Evermans, U. S. Fish Commission, Washington, D. C. Reports of Section Committees. General Session Forenoon Session, 11 to 12.30 Meeting Place: Main Hall, New Masonic Temple "Evidence of Alternative Inheritance in Second Generation from Crosses between Brahma and Native Texas Cattle." Robert Nabour, Kansas State Agricultural College, Manhattan, Kansas. "Progress Report on Corn Breeding." C. G. William, Agricultural Experiment Station, Wooster, Ohio. "Geographic Relation of Nervous Diseases in Massachusetts." R. E. Southard, Munson State Hospital, Palmern, Massachusetts. Reports of General Committee. Business Session. Secretary-Treasurer's Report. Plant Section Afternoon, 2 to 4.30 Meeting Place: South Hall, New Masonic Temple "The Principles of Breeding Recognized at Svalof." L. H. Newton, Department of Agriculture, Ottawa, Canada. "The Effect of Crowding on the Correlation of Characters in Oats." C. E. Leighty, Cornell University, Ithaca, New York. "Some Hereditary Characters of the Shirley Poppies." George H. Shull, Carnegie Institution, Station for Experimental Evolution, Cold Spring Harbor, New York. "Does Hybridization Increase Variability?" W. A. Gilbert, Cornell University, Ithaca, New York, and C. E. Myers, State College, Pennsylvania. "The Origin of an Early Variety of Matthiola by Mutation." H. B. Frost, Cornell, University, Ithaca, New York. / Friday, December 29 - (Continued) "An Experiment on the Method of Conducting Plot Tests." J. B. Park and L. H. Smith, Illinois Experiment Station, Urbana, Illinois. "The Importance in Plant Breeding of Maintaining a Constant Elimination Factor in Association with a Constant Nutrition Factor." H. L.Bolley, North Dakota Agricultural College, Fargo, North Dakota. "Asparagus Breeding." J. B. Norton, U.S. Department of Agriculture, Washington, D.C. "The Inheritance of Size of Capsules in Pepper Hybrids. (New Celestial x Golden Dawn.)" R. V. Winters, Cornell University, Ithaca, New York. Reports of Section Committees. Eugenics Section Afternoon Session, 2 to 4:30 Meeting Place: Special Session will convene at the Volta Bureau. Take Mt. Pleasant car and at Dupont Circle and P Street transfer to "Georgetown Only" car, get off at 35th Street and walk over one block up hill, or take "Georgetown Only" car on F or H Street, and without transferring proceed to 35th Street. Opening Address. Dr. Alexander Graham Bell, Washington, D. C. "Our Immigration Laws from the view point of Eugenics." Robert deC. Ward, Cambridge, Massachusetts. "Alternative Human Inheritance and Eugenics." F. A. Wood. After adjournment of the Special Session an opportunity will be given those who wish to inspect the vault and the filing system of the Bureau. General Session 8 to 10 p.m. Meeting Place: Main Hall, New Masonic Temple "Breeding Wild Animals." (Illustrated.) D. E. Lantz, U. S. Department of Agriculture, Washington, D. C. "Breeding Horses for the United States Army." (Illustrated.) George M. Rommel, U. S. Department of Agriculture, Washington, D. C. "Constructive Eugenics." Hon. W. M. Hays, Assistant Secretary of Agriculture, Washington, D. C. Saturday, December 30 Plant Section Forenoon Session, 9 to 12. Meeting Place: South Hall, New Masonic Temple "Comparisons of Yield between Hybrids and Selections in Oats." H. H. Love, Cornell University, Ithaca, New York. Variation in Pure Lines of Wheat." C. G. Williams, Ohio Agricultural Experiment Station, Columbus, Ohio. "Occurrence of Natural Hybrids in Wheat." L. H. Smith, Illinois Experiment Station, Urbana, Illinois. "Notes on Cereal Breeding in Great Britain and Australia." C. A. Zavitz, Ontario Agricultural College, Guelph Canada. "Some Practical Results in Breeding Winter Barleys." (Illustrated." H. B. Derr, U. S. Department of Agriculture, Washington, D. C. "A Comparison of Pure Lines of Browallia and their F2 Hybrids." A W. Drinkard, Jr., Cornell University, Ithaca, New York. / Saturday, December 30 - (Continued) "Further Studies of the Relation of Temperature to Variations in Pure Lines of Stellaria." R. J. Evans, Cornell University, Ithaca, New York. "Extension Work in Cotton Breeding." W. A. Orton, U. S. Department of Agriculture, Washington, D. C. "Inbreeding Cotton." W. W. Gilbert, U. S. Department of Agriculture, Washington, D. C. "A New Type of Long Staple Cotton." (Illustrated.) O. F. Cook, U. S. Department of Agriculture, Washington, D. C. "The Preservation of Superior Types of Cotton." O. F. Cook, Washington, D. C. Report of Section Committees. Eugenics Section Forenoon Session, 9,30 to 12 Meeting Place: Special Session will convene at the Government Hospital for the Insane. Take car marked "Anacostia" at Union Station or transfer to Anacostia car at corner of 11th and F Streets or at 9th and F Streets. Opening Address. Dr. William A. White, Government Hospital for the Insane. "Eugenics from the Standpoint of the Physician." Frederick A. Rhodes, Pittsburg, Pennsylvania. "Demonstration of Charts Illustrating Inheritance of Insanity." Henry A. Cotton. "New Studies on Inheritance of Insanity." A.J. Rosanhoff and Florence I. Orr, Kings Park, New York. "Neuropathic Families." William A. White, Washington, D. C. Presentation of one or more instructive cases now at the Hospital. Reports of Section Committees. General Session Afternoon, 2 to 4 Meeting Place: Main Hall, New Masonic Temple "Influence of Soil Type on the Plant Variety." J. L. Burgess, North Carolina Department of Agriculture, Raleigh, North Carolina. Report of Chairman of Committee on Breeding Nut and Forest Trees. G. B. Sudworth, U. S. Department of Agriculture, Washington, D. C. "Heredity of Feeblemindedness a Social Danger." (Illustrated.) H. H. Goddard, Vineland, New Jersey. Reports of Committees, Election of Officers. Election of Honorary Members Report of Auditing Committee. Members of the American Breeders Association receive, without extra charge, reports of the proceedings, the current issues of the American Breeders Magazine and other publications issued by the Association. The supply of Volumes I, II, III and V are entirely exhausted, but there is available a limited number of Volumes IV and VI; price, $2 per volume. Annual Membership . . .$2.00 Life Membership . . .$20.00 Delegate Membership . . .$25.00 Address all communications to - W. M. Hays, Secretary, American Breeders Association, Washington, D. C.